Forecasters say the cold front is pushing rain and heavy winds toward the coast. Forecasters say the worst is over, at least for the Triangle. The cold front, which blew damaging winds and heavy rain is headed toward the ocean. On Tuesday, a tornado damaged homes and trees near Stedman. Some areas between Fayetteville and Wilson saw more than four inches of rain. National Weather Service Meteorologist Brandon Dunstan said things will quiet down later today. “Most of the severe weather today, if any at all, is expected to be in the coastal plain and eastward. So main threat was probably gonna be damaging straight line winds, however you can't rule out a isolated tornado or two,” said Dunstan. Dunstan predicted the weekend will be quiet across the state. However, he warned another storm front is likely to visit North Carolina next week. Tornado In Eastern NC: "If My Husband Hadn't Been Holding On, It Would Have Sucked Me Out." More than a dozen people were taken to hospitals and an estimated 200 homes were severely damaged or destroyed following multiple tornado touchdowns in Eastern North Carolina on Friday. The National Weather Service confirmed an EF-3 tornado touched down in Beaufort county. 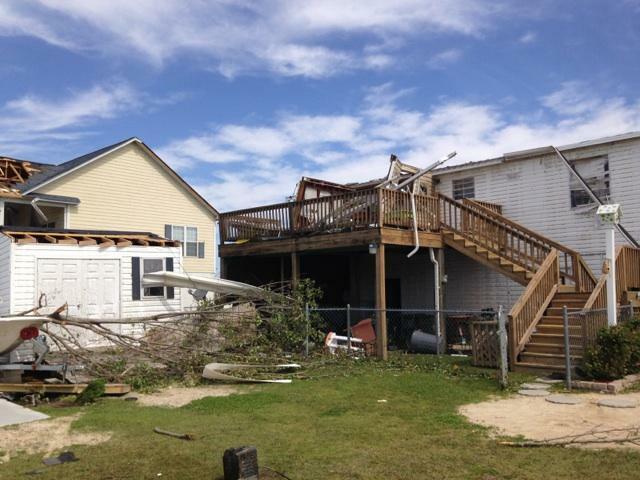 Other EF-2 tornadoes hit Beaufort and Pitt counties. Some of the worst damage was experienced in Chocowinity - a town of about 800 people, considered part of 'Little' Washington area.